Speakers from labor, industry, government and education explain why apprenticeship programs are important linkages between workforce, industry needs. (Oakdale, PA) – Representatives from industrial labor unions, manufacturing employers, state labor federations, state and federal labor agencies, education and workforce and development advocacy groups met today in Oakwood, Pennsylvania to discuss state and national efforts to bolster apprenticeship programs. The event was co-hosted by the Pennsylvania AFL-CIO and the Ohio AFL-CIO and the leaders of these organizations were on hand to highlight how apprenticeship programs are essential to their industrial states’ economic success. “There is a distinct difference between a job training program and an apprenticeship,” said Pennsylvania AFL-CIO President Rick Bloomingdale. “Apprenticeships are comprehensive experiences, where individuals not only learn a skill, they practice and develop that skill in conjunction with the needs of the business community, while earning a fair, living wage,” he said. “Any job training program that does not involve businesses and industry, a decent living and solid instruction, fails in comparison. 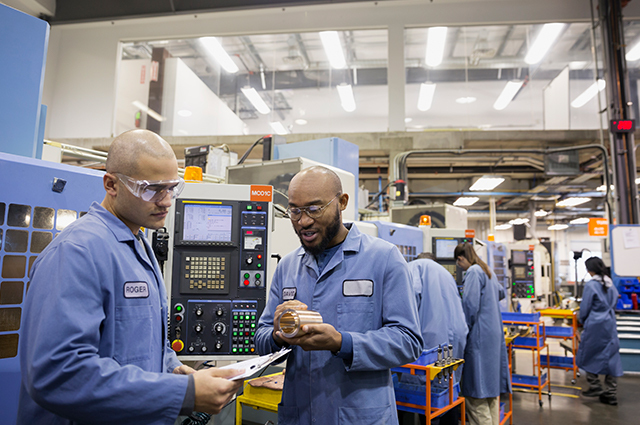 Highly skilled manufacturing jobs are the future, and apprenticeship programs are an essential part of filling those jobs,” Bloomingdale asserted. “Embracing and developing these training programs will modernize systems and procedures to improve productivity and safety,” said Ohio AFL-CIO President Tim Burga. “Workers and employers alike have everything to gain from robust and well-run apprenticeship programs,” he said. “The earn-while-you-learn concept in apprenticeship is very attractive to displaced workers and young people seeking to start a new career. Apprenticeships are key in advancing our local economies because the skills learned last a lifetime,” Burga said.